California summer. The season of fire. I live in California where it’s so dry a hot headed remark can start a fire. Tragically, there are sixteen fires raging up and down this beautiful state, taking forests for tinder, buildings for ash, wildlife for collateral, lives for sacrifice. My heart bellows for those who have lost their homes or businesses. My admiration soars for those who fight the infernos. My despair screeches for an end. I drive my car and think about how much I’ve contributed to the environmental crisis plaguing our world. Could I have walked or ridden my bike or stayed home? Yet I still drive. And the fires still burn. And people still suffer. 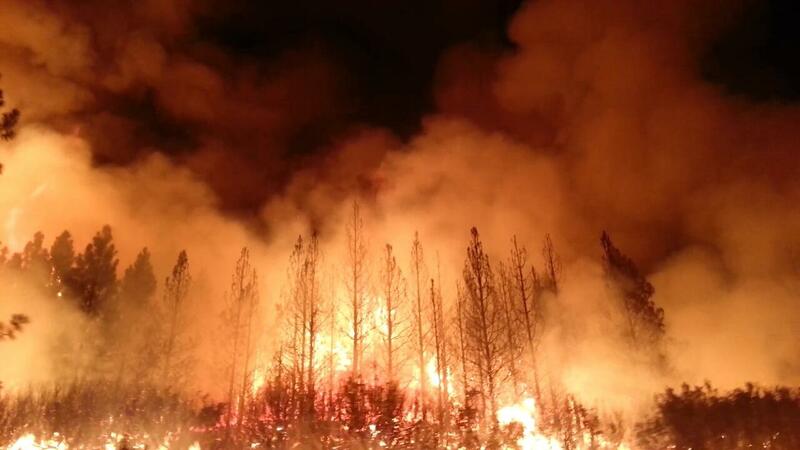 And California is laid waste by flame provoked by drought and heat. Fire clouds sere the sky. Fire thunder rakes the land. Not for me. For you, for the future, for the children. May the season of fire return to mere summer, hot and sunny. It’s terrible, isn’t it? Sharon, as of the first of the month, we have 12 going in Colorado, including the third or fourth largest in our history. The fire fighters managed to rescue a burnt bear cub. He’ll be released back into wild next year. But how many have been lost? Thanks for the added information, Paul. I know fires have been raging across much of the Western U.S. as well, and I’m as concerned about those as well. Do you know the story of Smokey the Bear? I’m probably much older than you, and when I was a kid, Smokey was famously featured in campaigns to prevent forest fires. A real infant bear was rescued from a fire in New Mexico and he became the living symbol of the icon, living out his life in the National Zoo after his injuries healed. Horribly, some of the fires started in southern Cal were started by an arsonist. Hoping all the fires are put out quickly but we know it’s going to be a long season. I’m familiar with the Smokey story. The campaign was still going strong when I was a kid. For the record, I’m 61. Arson? Sharon I wish I were not surprised. I really wish I was naive about what people will do. A few years back, Colorado had an absolutely huge fire by anyone’s standards. Know how it start? A woman drove to a wilderness campsite, and burnt all her ex’s love letters. Then left without bothering to make sure her fire was out. I cannot perfectly recall now, but she was some kind of official. Either a junior sheriff or forest ranger. Go figure. How do you make someone accountable for such an event? “I’m sorry” doesn’t cut it, but then nothing makes up for causing a catastrophe. Environmental crises as result of overpopulation and overuse of resources have a devastating effect on the world. Marina, I’ve been following your blog of course, but also the news about Greece. The fires in Greece have been horrifyingly tragic with so much loss of life as people were forced to the sea where many drowned as they tried to escape. Wishing some needed respite for your country. For what it might be worth, Marina, I’m hearing these the fires are growing in frequency because of Global Warming, and that there’s no end in sight as to how frequent they will become each year. It is so difficult to believe, because it is so stupid, but that is exactly what we’re doing. Shortsighted, selfish, money in the wrong pockets, laws straining on their leashes. I’ve heard way too many people declare that they bought this – land, forest, lake – and can do whatever they want with it. Because way too many of the rest of us say, whatever. Maybe we should let wildlife vote. This reminds me of your book. What horror. Jacqui, you remembered! The 1968 Paseo Grande Fire in Orange County is the subject of The Tree House Mother. The way firefighters attack infernos was changed as a result of the difficulties firefighters encountered in that blaze. Climate change, yes. We’ve also built our homes in California in areas that were meant to burn on a regular basis. Delaying the fires results in more tender, and when they do finally burn, they burn hotter with more devastation–Mother Earth’s repressed anger coming forth. Boy do I agree with you, Jenna. Making the wild lands and the coast into suburbia. Fire is part of the process of mother nature renewing herself. Just one more house gets in her way, even if it’s “our” house, and she burns with fury. Great post on a subject that has bothered me so long. Living here on the east coast I know of no such problems in the area. But when I see the horrors of California every year around this time, I feel terrible. So much nature destroyed every year. It is sad and especially devastating when there is loss of life and destruction of personal property. Earlier this year, we drove through Santa Rosa in northern California and saw the remains of the terrible fire that raged there last October, only a few houses from our daughter-in-law’s parents’ home. A huge section of the city was laid waste by fire, but it wasn’t a sensitive area you might think would be fire prone. It was just an ordinary suburban neighborhood. Only a few people had even attempted to start to rebuild when we visited in February. The East Coast has its own terrible issues. Blizzards of course, flooding and hurricanes. Two of my aunts and uncles lost their houses on the New Jersey shore during hurricane Sandy. One gave up – they don’t have enough to rebuild. So terribly sad for them as both houses had been the base for family gatherings all summer long. The East Coast is a very fragile ecosystem and it can’t stand up to battering by the Atlantic during big storms. Thank you for being so caring about California, Drew. We need all the love we can get. Yeah, here it is the hurricanes. Some of my friends lost homes to sandy as well. As for California, it is a problem that we will never be able to stop. No one has an ideas? Fire is a natural part of the ecological system, especially in forests. The problem is when sensitive areas get populated. We must protect human life (first of course) and then buildings, natural areas of great beauty and environmental value, and wildlife. It would be best if people wouldn’t insist on living in remote, fragile areas. But there’s always a balance required so people can enjoy the natural beauty of our country and we can still safely maintain those very areas. Public will and sufficient funding play into all of this. We don’t always have the means to do what we want, and there is debate about what to allow. My favorite is the independent loners demanding their “right” to live where they want, but when is the fire crew coming to protect their cabin deep in the woods. The smoke in Nor Cal is severe with ash and particulates. I have friends with asthma some who hightailed it to the delta where the wind blew some of the smoke away. I think the images of Yosemite Valley say it all when you can’t even see Half Dome! It will be a long while until we get rain. Your eloquence is breathtaking, rather than the smoke! Hope you are safe where you are! Thanks, Terri, we are safe now but there is a fire in Trabuco Canyon, only a few miles up the mountain that looms over the Saddleback Valley where we live. Huge plumes of reddish smoke are billowing as I write. Very scary and sad. We watch the news about Yosemite and Redding burning and are so worried. Monumental beauty, wildlife, and people, all at risk. This isn’t even our fire season – at least, it didn’t used to be. Stay safe, my friend. We’re fine, Paul, and not near any of the current fires. Thank you for your concern. My heart breaks for you guys. Those fires are terrible. My cousin in CO nearly lost his house after evacuating. Prayers. The Western U.S. is very vulnerable to fire, and as many of the areas that burn are nearly inaccessible, it’s tough to put out the fires. As they continue to burn, they encroach on inhabited areas. I’m so glad your cousin’s house didn’t burn and that he remained safe. My husband’s sister was evacuated 3 times last year during the massive fires that destroyed much of Ventura County and Santa Barbara. In between each evacuation order, she kept returning to work at the Ventura School District, even though all classes had be cancelled. She was so lucky that her home didn’t burn but we were scared for here. Thank you for your prayers, Audrey. We offer them too. The burn areas last forever. A few years ago, a friend and I set out to inspect a burn that was about 15 years old. I was shocked the area still looked more like a meadow than a forest. The tallest new growth was about three feet high. If fire burns really hot (So, how hot can hot be in a fire? Apparently some burn extremely hot.) it will burn deep into the root systems of the indigenous plants and they won’t recover quickly, if at all. Info I learned when helping to replant a local canyon area about 20 years ago. Such a sad scenario year after year devouring homes and people! I salute those firefighters who work day and night in incredible heat and poor quality air. I agree about the dedication of the firefighters and other front line workers. It seems to be the new normal, even worse than first understood. I really think we’re OK, Betty, but I thank you for your prayers. We live in suburban Orange County, not in an environmentally sensitive area. Still, as we saw in Santa Rosa, CA last year and Redding, CA this year, every neighborhood is a potential fire hazard. We don’t usually begin our rainy season until December, and it continues through March. We might get a little rain in October and November, so we’re a very long way off for natural relief. Unfortunately, an arsonist started a fire two days ago in one of the canyons in the mountains only a few miles to the east of us as the crow flies – and as embers fly. The fire has grown hugely since then, gobbling dry chaparral. The winds are bearing away from us but the sky, laden with purple-gray and red-orange clouds, is very scary. Very few people live in those canyons but those who’ve lost their homes are of course devastated. Unfortunately, it’s getting worse as the Holy Fire on the cusp of Orange and Riverside counties is spreading. Last night we attended an open air concert under a yellow brown haze of smoke. I don’t think the flames will get close to us, but embers fly. Thanks, Betty – you too. I agree that when a home is lost or worst still lives are lost because of these natural disasters it’s heart-breaking. I also agree that people are probably one of the biggest problems. As you’ve written, I too, wonder how I’m contributing to the “pollution” of our earth but aside from assiduously recycling I still drive and turn on the air-conditioner . . . . The one good thing about fire is that it helps disperse the seeds that were locked into cones and clears the land for regeneration. The land-use regulations are probably too lax (as was the major problem with the Houston, Texas flooding disaster) but we humans keep “making territory”. I used to teach my students about Arcosanti and Biosphere experimental habitats as part of the architecture units. Arosanti has proven successful in creating a fully independent and re-usable, renewable city. Biosphere I was pretty much a disaster but Biosphere II is more successful. Both show ways of living without sapping the earth of its resources. In California, the biggest water users are the farmers, but agriculture is also one of our most important assets. So we can turn off the faucet when brushing our teeth, which I’ve always done, but the agricultural community has to find better ways of using water. Yes, we are all responsible, but only as part of the whole Earth community. California has suffered years of drought, rising temperatures, low reservoirs, dried up rivers, and bug infested forests (because of the first two reasons) making the trees more prone to conflagration. As I wrote to Catnip Blog, the biggest water user in California is the agricultural industry, but we need it to be healthy and flourishing. You and I might save a few gallons of water each week but we can’t make up the amount of water farmers need. It’s so terrible and sad, and it seems to get worse each year. I can’t even imagine the terror those who are affected the most must feel. And still most people don’t even start doubting the wisdom of their actions and keep polluting and polluting. I wonder how long this will work, my guess is much less than 50 years. What awful things to happen to people – so sorry to read about such misery in Germany. I worry too about how long we can last like this.